Powers: Superhuman strength, durability, reflexes, and agility,Wall-Crawling ,Organic Webbing: Unlike Spider-mans,Shape-shifting,Accelerated Healing factor,Immunity to Spider-Man's spider-sense, Can camouflage(Like Predator) & has toxin slime from his mouth. Venom was born to a race of symbiotes called the Klyntar , Creatures that bonded with other living animals to feed upon their adrenaline. 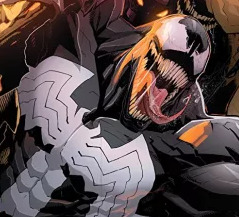 However Venom was dubbed a insane for its desire to form a lasting bond with a host and imprisoned upon Battleworld to rot away without a host. A chance occurrence however saved its life. Spider-Man, his costume in taters after a grueling battle with an army of Supervillains along side many other of Earth's heroes stumbled upon a machine that he thought would restore his suit. The symbiote was released and bonded with its savior. After returning from Battleworld at the end of the Secret Wars, Deadpool got hold of the suit and that's why it seems crazy at times. Spider-Man learned that the black costume was in fact a symbiote (Klyntar) that was attempting to bond with him, he ripped the symbiote off in a church by utilizing its natural weakness to sonic's. Unfortunately, Spider-Man collapsed in pain, unable to withstand the bone rattling sound of the church bell. The symbiote, having developed a perverse sense of affection toward its host, dragged Spider-Man away from the bell before he could suffer permanent brain damage, or worse. The symbiote thus consigned itself to death and vanished down into the depths of the church. However, a chance meeting with Edward Brock would change everything. Brock was mentally unstable man who blamed his own failure in life on Spider-Man and attempted suicide but could not bring himself to do it. Brock went to church to ask God for forgiveness for his attempted suicide. It was at that exact same time that Spider-Man had rejected the symbiote. 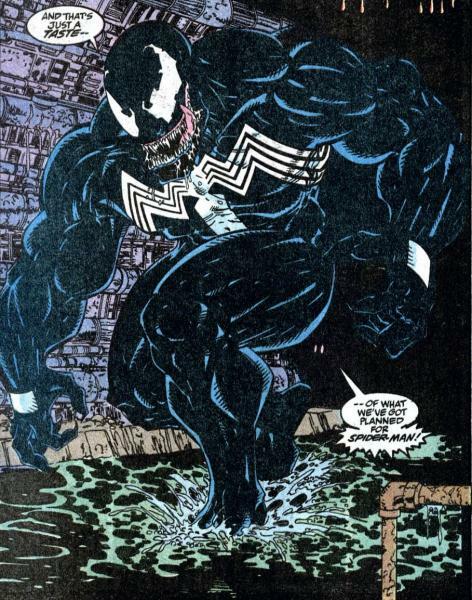 Attracted to Brock's strong emotions, the symbiote bonded with Brock and his madness became its own. The two were now united in a vengeful mission: the death of Spider-Man! Last updated by SymbioteSeeker on November 6, 2018. Contribute Profile Information for Venom.